A boat trip to visit a romantic bay of turquoise crystal clear water beckons, fish swimming around as you float gently on the tide. And for lunch on the island of Veli Iž , Restaurant Madraž invites you to a comfortable and cosy patio and to watch as their chef prepares a delicious meal in front of you. Enjoy fresh fish or a one-kilogram steak cooked to your taste on a charcoal grill overlooking the beauty of the sea before returning to your apartment to chill on your private balcony, or by the pool, with a glass of local red wine as the sun slowly slips below the horizon. The perfect end to a perfect day. Welcome to your perfect holiday destination. 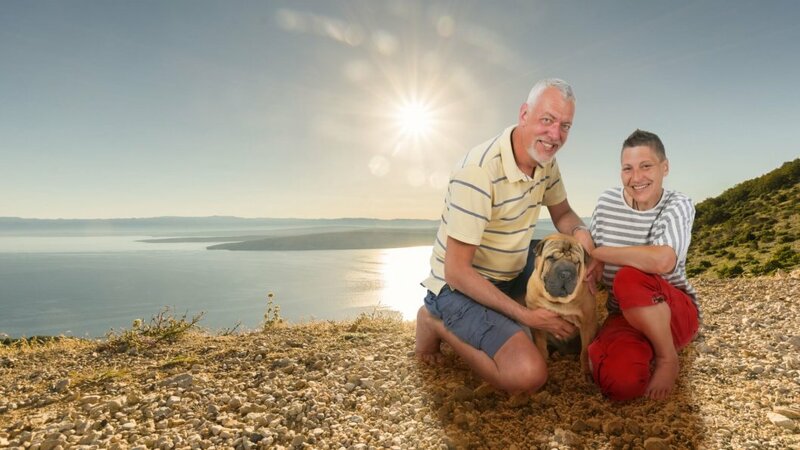 Your hosts, Claus and Martina take excellent care of their guests and will do everything they can to make your stay at Happy Haven House an extraordinary experience. They are incredibly knowledgeable about the surrounding area and can help you organize unforgettable experiences – you can even book a private boat trip with your skipper Claus! You will find our cosy and comfortable house in charming surroundings. Enjoy the silence after returning from a long trekking tour or relax on your balcony or inside your Apartment. Enjoy the dreamlike view from your room and feel the sea calling you while you enjoy breakfast in your own room. If you have questions about your hosts or want to know more about Happy Haven House before booking, please call or send us an email. We’re always happy to help.